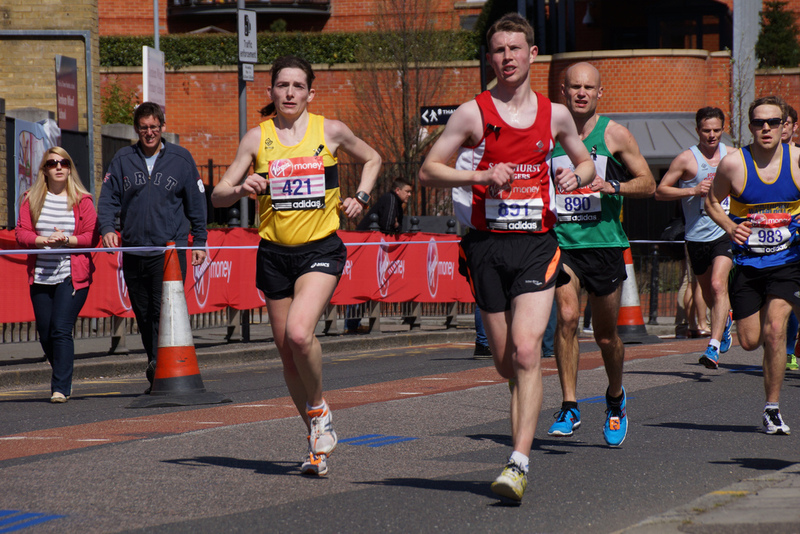 »Achievements»Vitality 10k – Will Lucas reports back from his 1st race… a big one at that! Vitality 10k – Will Lucas reports back from his 1st race… a big one at that! Having only joined Sandhurst Joggers a few months back, I had never before considered actually taking the plunge and signing myself up to an official race. However when the opportunity was handed to me and all it required was a yes or no answer, I decided that the Vitality London 10k was the one for me! When the day arrived I made my way into Green Park to meet with some familiar faces and get my bearings before making my way to the start. Having started with some feelings slight nervousness of not knowing what to expect, they soon passed to leave me with excitement as I took in the sights and sounds of the busy park full of people getting ready for the race. It was not long before it was time to start heading down to your designated coloured zone to line up for the start in which I found myself on my own and fairly far back. To me this didn’t matter at all as everyone seemed in high spirits which created a great atmosphere of inclusiveness. Slowly the crowd surged forward closer and closer to the start and before I knew it, there we were, just waiting for the signal to go. As we started I found the pace very slow and with so many people out there quite difficult to get around and go at my desired pace. This was not a huge problem as running through central London was not something I imagined I would ever do and there was so much else to take in other than my pace. With crowds cheering and clapping on all sides of the street, bands playing every km or so and not to mention the iconic sights never seen in this light, I found the kilometres soon passing by. By 5km the streets seemed to be much quieter and the stretch to 7km felt like the hardest point. The temperature in the city that weekend was hot and fairly humid. Much of it felt like there was little to no breeze which made the water spray all the more welcome. At this point I noticed the streets seemed to be becoming much livelier again and as the 8th KM past I felt like the final two would not be a problem. I was not wrong, spurred on by the same sights, sounds and support of the beginning I only wished there was a little more to go! After crossing the finish line the whole race was made even more worth it when I picked up an excellent bag with finishers T-shirt, medal and a few other nice little bits. All in all a great race which I would recommend to anyone especially those that have always thought about it but not quite made it to the sign up stage.